The city of Nanaimo has a very close relationship with the art world. With murals and exhibitions on every corner, it is no wonder graffiti removal is a necessity. The city is beautiful and Nanaimo Graffiti Removal aims to keep it that way. Boasting several art galleries including the Nanaimo, Yellowbird and Art 10 Galleries, the city encourages sanctioned art. Nanaimo does, however, have a rebellious side as well! Certain outdoor spaces around Nanaimo have been labelled “legal walls”. These spaces are blank canvases for street artists and the Chase River Parkway is one of the largest. The tunnel was constructed to let the Chase River pass under the parkway but has since become a haven for graffiti. This has become a popular spot for artists and visitors alike, but Nanaimo Graffiti Removal knows that sometimes artists colour outside the lines. 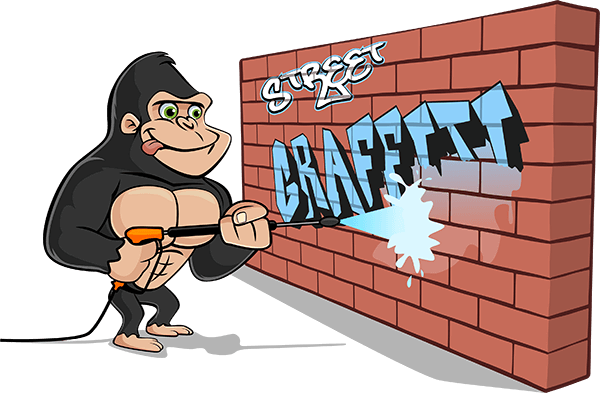 When street art spills off the legal walls and onto your property, Nanaimo graffiti removal will be there to fix the mess. Although done with the best intentions, improper removal of graffiti from outdoor property surfaces can make an even bigger mess! There are tons of theories across the internet as to how to remove graffiti. Everyone knows, you can’t believe everything that you read online. Certain chemicals can partially remove paint, but allow the stain to run down the surface, effectively spreading the problem area. Our Gorillas use eco-conscious cleaners as well as other tools, more precise to the specific conditions of removal, such as power washers or specialty tools. Our experienced employees are sure to contain any staining, as well as complete removal of an graffiti without any hassle. Nanaimo Graffiti Removal removes any tags that are racially offensive immediately and free of charge. Save yourself the headache of ‘DIY removal’ and call on our Gorillas to do the job for you. We will take care of your property as if it were our own.